Boysen State Park and Reservoir near Shoshoni. For those with a penchant for fishing and prehistoric geology, the Boysen Reservoir Trail can’t be missed. 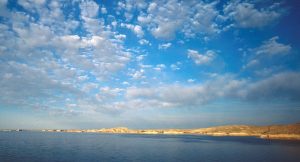 Explore Shoshoni, Boysen Reservoir State Park and Reservoir and Wind River Canyon. The dock at Boysen Reservoir is a beautiful launch for a day on the water. Boysen lost the lawsuit, his fortune, his dam and his dream. The dam came down, though concrete abutments are still visible along the river. If you stop off to have lunch beneath the stately cottonwood trees at Upper or Lower Wind River Campgrounds, thank that dreaming Dutch immigrant Asmus Boysen for the shade. His dam created enough silt for the cottonwoods to get a toehold on the rocky shores of the river. Shoshoni, on the northern edge of Fremont County, was founded in 1904. The town has gone through several boom and bust cycles from oil and gas exploration and today is our gateway town to Boysen Reservoir and the Wind River Canyon Scenic Byway. Shoshoni lies in a high basin surrounded by the rugged Bridger and Owl Creek mountains to the north and the Wind River Range on the far western horizon. The surrounding country speaks of difficulty: Badwater Creek, Poison Creek and Tough Creek. At the same time, it has a stark beauty that beckons exploration. Bring your fishing rod and license for the Boysen Reservoir. At 19,500 acres, the reservoir is one of the largest in the state. It provides excellent fishing for walleye and rainbow trout, particularly in the spring. Other species of sport fish include cutthroat trout, brown trout, sauger, perch, crappie, ling (an odd looking member of the cod family), largemouth bass and lake trout. 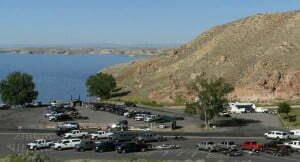 Boysen Reservoir was created in 1951 to provide irrigation water to 100,000 acres of farmland in the Bighorn Basin. The lake and surrounding shoreline were designated a state park 5 years later. The Wind River flows north here before it meets the dam and Wind River Canyon. For information contact Boysen State Park (307-876-2796), located 13 miles north of Shoshoni on Highway 20. There is a marina with boat rentals and fishing licenses or pickup a fishing license from any number of businesses in Shoshoni. To get to the western shore of the reservoir, drive south on Hwy. 26/789 five miles west from Shoshoni to West Shoreline Drive, where signs will guide you to campgrounds and boat ramps. If you don’t mind driving on gravel roads, take West Shoreline Drive Loop 1 to several campgrounds, then back out to the main paved road a mile west of South Muddy Campground. You can also explore Cottonwood Bay, a popular arm of the reservoir where boaters enjoy water skiing and fishing and you can spread out a blanket on the sand beach and soak in some sun. Along your way, keep an eye peeled for antelope and raptors that live in this rugged desert country. To the north lie the Owl Creek Mountains, part of the sprawling Wind River Indian Reservation. You’ll want to spend some time fishing from the rocky shoreline, or taking a walk through the desert. You can also fish Lake Cameahwait located just off the West Shoreline Drive. West Shoreline Drive Loop 2 will take youback out to the paved road and you can drive back south to catch Hwy. 26 for a return to Shoshoni. West Shoreline Drive Loop 2 will take you back out to the paved road and you can drive back south to Hwy. 26 for a return to Shoshoni. 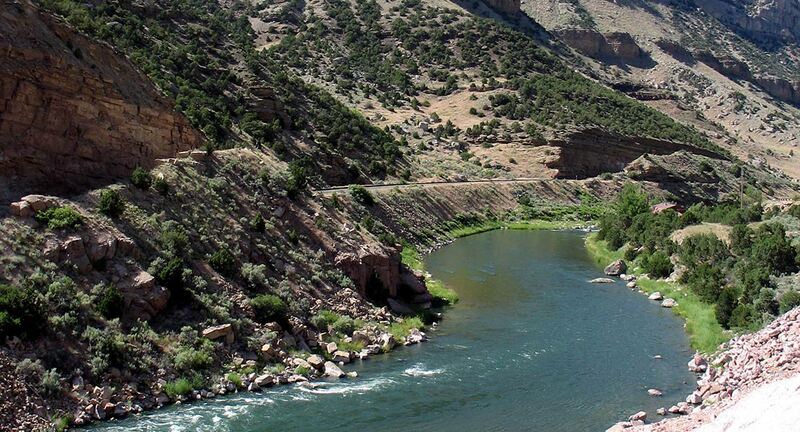 For the next leg of your journey, explore the Wind River Canyon Scenic Byway. Drive north on Hwy. 20 for 14 miles to Boysen Dam. This is where the Wind River begins carving down through rock to form the canyon. Enjoy the canyon geology as the river slices its way through formations from the Triassic period (208-245 million years old) to the Precambrian period (570-2900 million years old). If you drive the length of the canyon, it’s an additional 14 miles. Don’t forget to stop to fish in the river at the base of the dam. The river here provides some of the best fishing in the area and you may hook into trophy-sized walleye, rainbow trout or brown trout. Your Wyoming fishing license is valid downstream to the first highway tunnel. Beyond that point, you’ll need a Reservation fishing license.